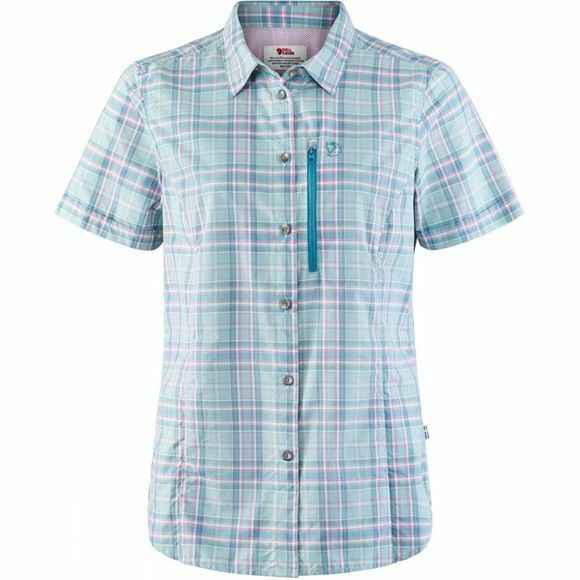 The lightweight, comfortable Womens Abisko Hike Shirt Short Sleeve has been designed for trekking and outdoor life in the summer. Fjällräven have used soft functional fabric that wicks away moisture and feels cool against the skin. It's takes up little space when packed, so it's perfect for back–packing and camping. With a well–fitting, feminine cut that's shaped at the back the Abisko Hike is sure to become a favourite. Buttons at the front and a ventilation opening at the yoke help to release excess heat, while a vertical, zipped chest pocket is mesh lined for breathability. There is even built in UV protection!